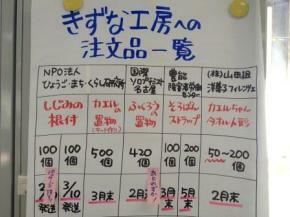 Two months and a half have passed since “Kizuna Kobo”, the cooperative craft studio, opened. Twenty five people have registered with the studio to engage in handicraft. Recently, they have received an increasing number of orders from groups in different areas. 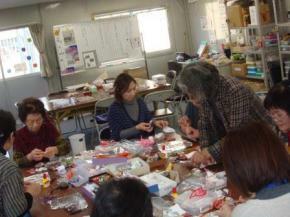 At the end of January, a workshop for making kaibina (little hina[i]dolls made of seashells) was held in the studio for anyone interested. We had thought about how we could get more people to register, and decided to invite instructors and hold workshops open to both members and non-members of the studio once a month. On the day of this open workshop in January, 16 people participated and the studio’s atmosphere was very cheerful and pleasant. Nine people registered with the studio after the workshop. Kaibina is a hina doll made of seashells. The shells are decorated with colorful Japanese crepe, as if to dress them in kimono. These kaibina dolls are now on sale at the Volunteer Center. “Which doll will be bought first?” “We have to make more in a hurry or they will be sold out!” The members were very excited. A few days ago, the instructor who taught them how to make kaibina visited the studio. We reported the good news to her. Thirty-one sets of kaibinadolls were sold in total as of February 23rd, 2012. I hope all participants will work in the studio at their own paces. It will be great if the studio becomes a place where participants can think about their future or about someone in a distant place receiving their handicrafts with a smile. [i] Hina-matsuri : The Japanese Doll Festival or Girls’ Day on March 3rd. This is the day when families pray for the prosperity and happiness of their daughters. 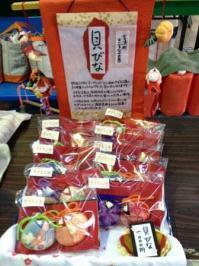 Families generally start to display hina dolls in their house in February. How wonderful that you provide a place and a purpose for a group to get together. And to have an order for the crafts is wonderful. We all work better when others value our work. Keep up the good work. Persevere!